When it comes to transcontinental flights there is a lot of competition. United, American, Delta, Virgin America, and JetBlue all fly transcontinental routes which are typically JFK-LAX/SFO. Since there are so many options I thought it would be a good idea to over ways to be able to upgrade into First or Business Class on these routes. Many of these airlines are also enhancing their offerings on this route making upgrading with miles or systemwide upgrades more desirable. 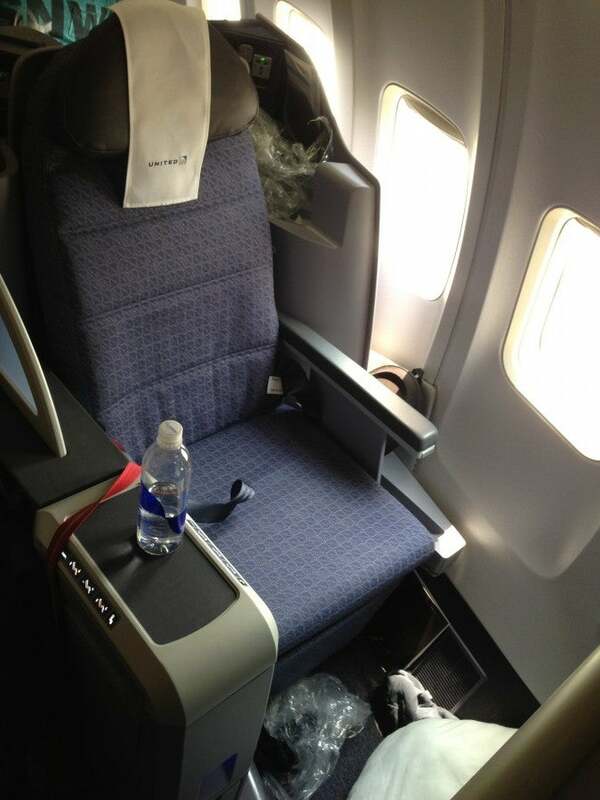 I recently flew JFK-LAX on United’s new business class product and had a good experience overall. Delta is adding lie-flat seats to their BusinessElite cabin on this route and American is replacing their current planes with three class A321’s which will be used on their transcontinental flights. With all these new improvements flying upfront is becoming more important on these routes. 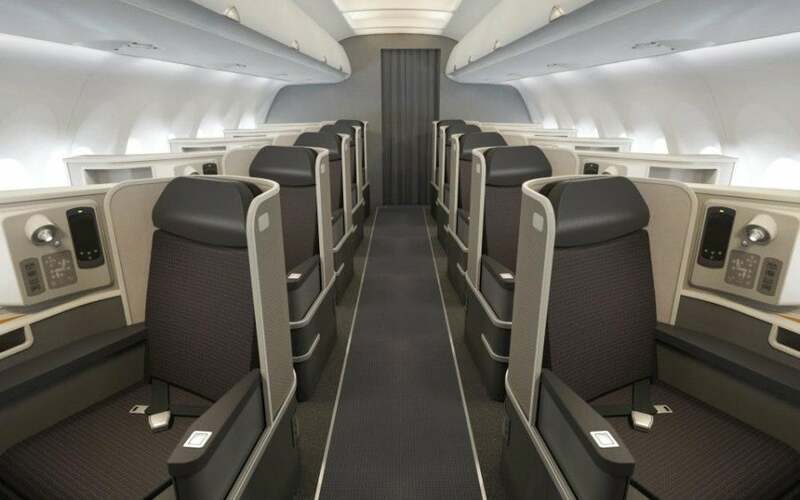 American’s A321’s outfitted for transcontinental service will replace American’s current 767-200’s used on routes from New York JFK and San Francisco and LAX. American will upgrade Executive Platinum (100,000 EQM level) flyers starting at 100 hours before departure. Upgrades are prioritized by the time the upgrade was requested. Gold (25,000 EQM) and Platinum (50,000 EQM) flyers earn four 500-mile upgrades for every 10,000 miles flown. Those upgrades can be used on the premium routes – upgrading a JFK-LAX itinerary would cost five 500-mile upgrades, since the flight is just under 2,500 miles, but JFK- San Francisco is 2,586 miles so requires six 500-miles upgrades. The new A321 will be featured on JFK-LAX and JFK-SFO, which are considered American’s premium routes from New York. Executive Platinum members may request complimentary upgrades when traveling on any purchased, published fare on eligible flights so they would not need to use 500 mile upgrades on these routes. 500 mile upgrades can only be used routes within and between the U.S., Canada, Mexico, the Caribbean, the Bahamas, Bermuda, and Central America. Non-elite status members or elites who want to upgrade in advance can upgrade from coach to business class by either buying 500-mile upgrades at $30 each or using miles and a cash copay. For most fares, an upgrade from coach to business class costs 15,000 miles and $75. Full fare economy (Y and B fare classes) to business only requires 5,000 miles each way. You can also upgrade from business to first class for 15,000 miles and $175 or only 15,000 miles if booked into full fare business class (J,D and R fare classes). 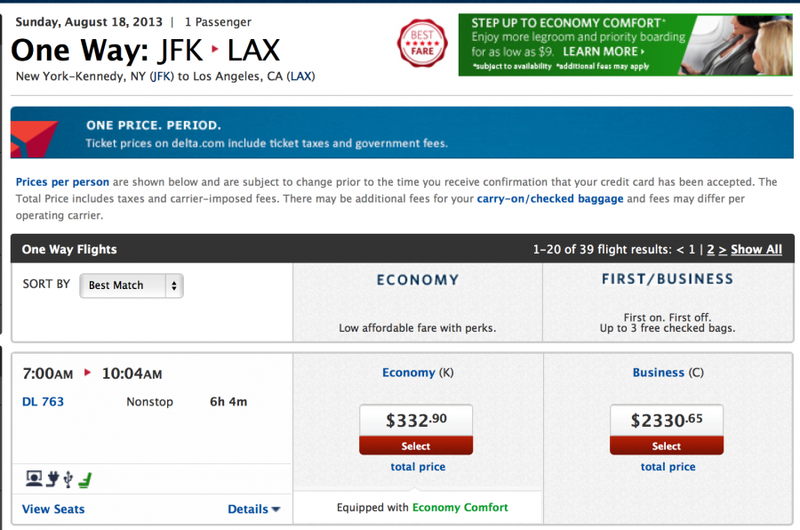 JFK-LAX is $162 and elite members can use 500 mile upgrades to upgrade instead of paying $2187 for business class. 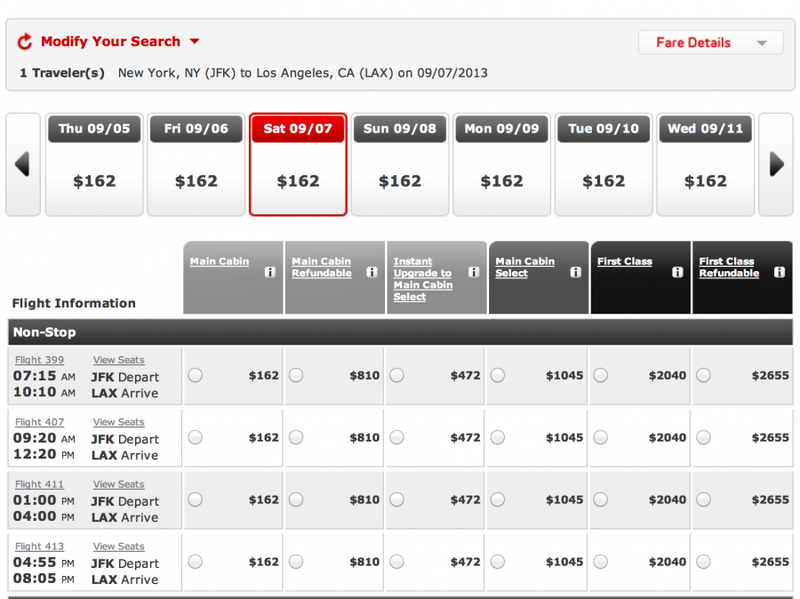 You can request an upgrade when making your flight reservations on AA.com or through the phone. If your upgrade has not been confirmed as of the time of check-in, you will automatically be given the opportunity to be added to the Airport Upgrade Standby List while checking in. The date and time of your original request, along with your elite status level, will determine your priority on the Airport Upgrade Standby List. 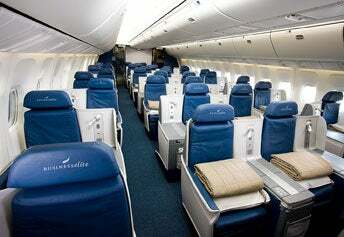 Delta is operating 767′s with lie-flat seats on JFK-LAX 4 times per day. While Delta allows customers to upgrade with miles, this is nearly impossible. The reason is because there is hardly ever any upgrade space open in advance on their transcontinental routes and mileage upgrade requests usually do not carry over to the day of departure so if you are not upgraded in advance you would be out of luck on these routes making mileage upgrades not an option. The lowest upgradeable fare is $332 one-way vs. to pay $2,330 for business class outright. However if upgrade space ever opened up, passengers would need a coach fare booked in Y, B, M, S, H, Q, or K class which are higher- and full-fare coach fare codes. Discounted or low-level fares in L, U and T classes are not eligible for mileage upgrades on these routes. The cost to upgrade from those would be 12,500 SkyMiles each way with the exception of those booked in a Y fare class, which would only require 5,000 SkyMiles each way. Delta does do Medallion upgrades, but only at the gate, minutes before departure. Medallions are cleared first by Y fares (full Fare) starting with Diamonds and finishing with Silvers. Then those in all other eligible fare classes are cleared based on Medallion level, fare class and whether they hold the Delta Reserve or are trying to upgrade companions (those clear last). United p.s. flights are not valid for complimentary Premier upgrades (whereas Delta does allow complimentary Medallion upgrades and American for Executive Platinum members). Customers wishing to upgrade must use regional premier upgrades or global premier upgrades to upgrade. Premier members will earn two Regional Premier Upgrades when they reach 75,000 premier qualifying miles or 90 premier qualifying segments, plus two more for each 25,000 PQM or 30 PQS earned thereafter. Regional premier upgrades can also be used on all flights between the continental U.S. and Hawaii, as well as all p.s.flights between New York (JFK) and Los Angeles (LAX) or San Francisco (SFO). You can use a regional premier upgrade to upgrade on JFK-LAX flights, meaning you can book a coach fare for $162 one-way and fly business class. Premier 1K (100,000 elite miles) members earn 6 one-way systemwide upgrades at hitting 100,000 EQMs, and then 2 more for each additional 50,000 elite miles earned. These are valid on any fare class and are transferable to others and eligible on Copa flights as well. You will also earn two more for each 50,000 PQM or 60 PQS earned after reaching Premier 1K. Each global premier upgrade is valid for a single one-way, one-cabin upgrade so you can’t upgrade from economy to first, only economy to business, or business to first. In the case you have both regional upgrades and global upgrades it makes more sense to use a regional premier upgrade on this route. United is also known for selling upgrades in advance so you can always log in to united.com to view your reservation and see if it offers you a “buy-up” to business class. There is a big Flyertalk talk that talks about “buy-up” successes and what fares and routes these typically are available on. 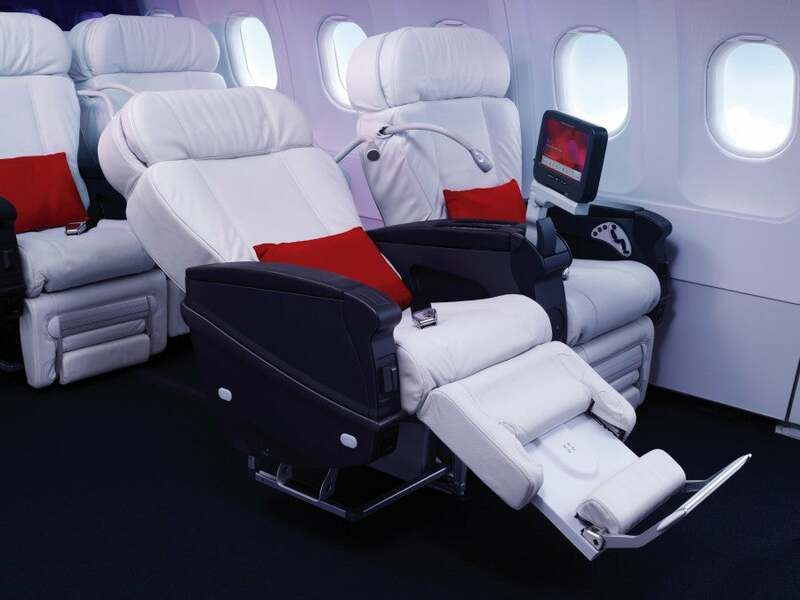 Virgin America’s First Class seats. For the airline’s long-haul transcontinental routes, the price to upgrade from Main Cabin to First Class is $399 each way. This option can be much more affordable than purchasing First Class outright. A sample first class fare will run around $2,000 each way vs. a coach fare which could be as little as $150 each way, meaning even paying the $399 to upgrade you’ll still save around $1,500 each way from upgrading as opposed to buying the First Class fare outright. Consider buying a coach fare for $162 one-way with the hopes that Virgin sells an upgrade at check-in for $399 vs. paying $2,000 to buy the fare. You can get one of these upgrades in a few different ways. Beginning 6 hours prior to departure, you can upgrade when you check-in at the airport or online. To upgrade while checking in online, you should enter your travel information and select the flight you’re checking into. You will have to choose a seat in your current cabin before starting the upgrade process. Then you will see an option to upgrade to First Class if available, at which point you can pay for the upgrade. Note, if there are no remaining seats available in your current cabin, you will not be able to upgrade online and will have to try at the airport. Those checking in at the airport can upgrade at a kiosk or the counter, or for the procrastinators out there, you can even do it onboard. Once onboard, if there is a First Class seat available that you’re interested in, point it out to the flight attendant to confirm it’s available, and he or she should be able to seat you there and you can then upgrade by swiping your credit card through the seat’s RED personal entertainment system.